Bob the Builder™ and Angelina Ballerina™ arrived in the Riviera Nayarit for a stay at the Hard Rock Hotel Vallarta, bringing smiles to the faces of all the kids who visit this all-inclusive resort. The Hard Rock Hotel Vallarta (HRVH) opened the doors to their brand new Little Big Club™ on Wednesday, December 9, 2015, together with HIT Entertainment, Ltd., a global leader in kid-centered entertainment. This new area is ready and waiting to offer a unique experience to children visiting this all-inclusive property located in Nuevo Vallarta, Riviera Nayarit. 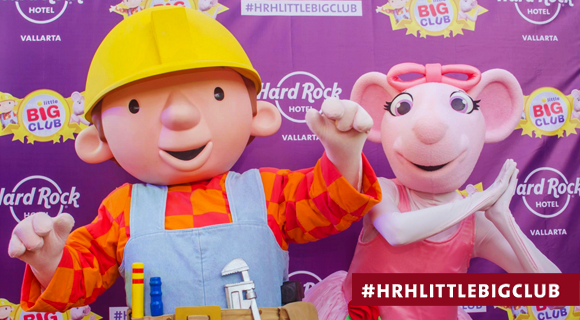 “Angelina Ballerina™ and Bob the Builder™ have come to stay at the Hard Rock Hotel Vallarta,” declared Luis Entrala Fábregas, General Manager of the HRHV. The Little Big Club has an interactive Bob the Builder™ themed area with all the specialty tools needed for kids to develop their creativity by building arts and crafts. There’s another section with games centered on an Angelina Ballerina™ theme, where children can star in their very own episode, dancing to choreography, dressing up in costume and more to create a magical ambiance. The Club also has a stage for interactive activities with both characters where they will project A/V presentations in English and Spanish. The Little Big Club is part of the all-inclusive experience for guests of the HRHV so parents can be safe in the knowledge their kids will be well cared for and having the best time possible. This area was created to welcome children from 18 months to four years of age when accompanied by an adult; kids 4-12 years of age can come by themselves. For more information visit: www.littlebigclubvacation.com.